While this card is face-up on your side of the field, this card cannot be removed from play. Place 2 coutners on this card each time a Dinosaur-Type Monster Card is sent to your Graveyard. By Tribut.. Tribute 1 Dinosaur-Type monster to activate this card. This card remains face-up on the field for 3 of your opponent's turns. While this card is face-up on the field, you can Normal Summon or Set Di.. 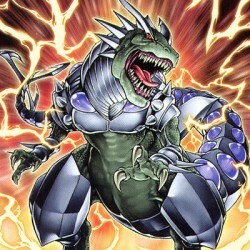 Select 1 face-up Level 5 or higher Dinosaur-Type monster on your side of the field to activate this card. Select and return to the owner's hand(s) up to 2 monsters that are either lower Level than th..
Activate only when a monster you control has attacked your opponent directly. Gain Life Points equal to the Battle Damage that the monster inflicted to your opponent. ..